The 6.5mm/.264 inch bore has recently enjoyed a resurgence of interest. Several rifle manufacturers currently produce 6.5x55mm sporters, exposing a new generation of shooters to this famous old Scandinavian service and hunting cartridge. Competitive HighPower and Silhouette shooters have also shown great interest in the 6.5mm bore size. The 140 grain #1740 bullet is a superb competitor for ranges out to 1000 yards, in medium- and high-capacity 6.5mm cartridges. While they are recognized around the world for record-setting accuracy, MatchKing® and Tipped MatchKing® bullets are not recommended for most hunting applications. 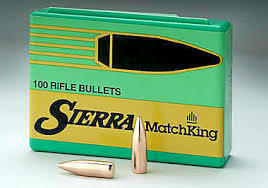 Although MatchKing® and Tipped MatchKing® bullets are commonly used for varmint hunting, their design will not provide the same reliable explosive expansion at equivalent velocities in varmints compared to their lightly jacketed Hornet, Blitz or Varmintercounterparts.